Baker didn’t placekick at all in college, where he played fullback and left as Oregon State’s all-time rushing leader at the time with 2043 yards. He was chosen as a future pick by the Los Angeles Rams in the 11th round of the 1952 NFL draft, but was traded to the Redskins in ‘53, where he was a backup fullback and punter. 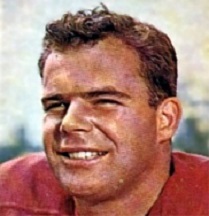 Baker missed the next two seasons due to a stint in the military and, upon his return in 1956, took on placekicking duties in addition to punting. Redskins went 6-6 to finish third in the NFL Eastern Conference. Baker followed up by tying for the NFL lead in scoring with Cleveland’s Lou Groza as he totaled 77 points on 14 field goals, 29 extra points, and a touchdown on a fake field goal. He led the league in punting in ’58 with a 45.4-yard average. Baker was dealt to Cleveland in 1960 to take over for the retired Groza, but when “The Toe” returned in ’61 he handled only the punting and was then traded to the Dallas Cowboys for 1962. He was selected to the Pro Bowl in ’63 after kicking 16 field goals and averaging 42.3 punting yards. Baker was traded to the Philadelphia Eagles in 1964 as part of a deal that brought flanker Tommy McDonald to Dallas and spent the remaining six years of his career there. He set a new franchise record (which he twice broke) with 16 field goals in his first season with the Eagles and was again named to the Pro Bowl. He led the NFL with a 72.0 percent success rate on his field goals (18 of 25) in 1966 and was named to another Pro Bowl following a ’68 season in which he booted a career-high 19 field goals, out of 30 attempts, although he also missed four of 21 tries for extra points. He gave up punting duties in 1969, his last season at age 40, and finished with a then-NFL record of having scored in 110 consecutive games. Overall, Baker kicked 179 field goals out of 316 attempts (56.6 %) and added 428 extra points, out of 444 attempts. Adding in two TDs, he scored a total of 977 points, which ranked second in NFL history at the time (as did the field goal total). Of those totals, 54 field goals, 91 PATs, both touchdowns, and 265 points were scored with the Redskins. Baker also averaged 42.6 yards on 703 punts, 223 for a 43.4 average coming with Washington. Virtually all of his 234 career rushing yards and seven pass receptions were with the Redskins while he completed one pass, for a 58-yard TD out of punt formation, with the Eagles in 1968. Baker was selected to a total of four Pro Bowls, one with Washington.